Just a quickie to say how pleased we are with the covers you made for us. Also thanks for sending them up to my mum's place. We have just got back to Devon so have been in our autosleeper for nearly a month. The quality is great and as you explained they tumble dry very well as we found out. We did 1900 miles on our trip and even managed John O Groats!! We would recommend you product to all our mates. said, thank you. Now no more hard work to make up the bed, GREAT. The matress cover and fitted sheet arrived today and fit brilliantly. Many thanks for a great service. My goods arrived within the timeslot allocated and as described on the website. They look lovely and match perfectly with our new van. The service at all times has been fantastic. All in all a big well done and thanks. Just received my order for the Cream/Walnut Whip Bedding for Island Bed. It is fabulous. I love it. The material feels gorgeous. It looks so cosy. The delivery service also needs noting, especially when advised of the one hour time slot. Cannot wait to go away now to try it out. My sheets were delivered today - thankyou for your excellent service. Thank you so much for getting my order to me before my holiday, it fits perfectly, roll on Friday when we will be off to Greenwich. Just a quick line to say how pleased I am with duvets and covers they are very good quality and your service is excellent. I shall pass details on to friends and family, I shall also need a double duvet later in the year. Thankyou for returning my sheet so quickly! 'new' fitted sheet made by you on our motorhome bed and it fits beautifully. Bedding received and installed in caravan! Just wanted to say thank you. Your service is second to none, I was kept up to date on progress, everything arrived together as promised even though I ordered the top sheet on a different day (well impressed) and I knew I was dealing with real people as opposed to faceless beings with automatic responses - so refreshing. I thank you again and I shall be recommending your Company. My order was received a few days ago. It was certainly worth waiting for. I would like to say how pleased I am with it, I love the colour and the quality. I look forward to many cosy nights spent in it, the first being this weekend! Thank you for your prompt and courteous response, we all make mistakes its how they are dealt with that makes the difference. Look forward to dealing with you again and I would not hesitate to recommend your company and products. "Hello Freedom Is ! A short note to let you know that the contents of the below order is now set out in my fab new van and looks absolutely fantastic. I am really pleased and wanted to share my thoughts with you. I was also very impressed with the courier delivery service. To be advised of a 1hr time slot and the name of the courier was the most refreshing and a fine example of efficiency. I will certainly recommend your services at every opportunity. " "Just to let you know we received the caravan fitted sheet yesterday. We are very pleased with both the fit and the quality. No more wrinkled bottoms in the morning !! !Thank you for your excellent service." Hi Adrian we hope you all had a nice break. Thank you for completing and delivering my sister-in-laws order on time. She was very pleased and grateful. As for us we, once again, found the 'Snuglux' excellent. The king size singles are ideal and the size is perfect. They are cosy, warm and adaptable and the fabric washes very well and requires very little ironing which is ideal especially when on holiday. The product once again meets our needs/requirements and we will certainly be recommending them to our friends and family. Thank you also for the duvet storage bags which will be very useful and again very much appreciated. Satisfied customers is their goal. "I received my order today and it fits perfectly. Many thanks for your excellent service and for making sure I had my order before I go away . I hope to shop with you again and will recommend you to my friends who have caravans. "Thank you for the delivery of our polycotton bed set which arrived safe and sound today and in good condition and we will surely pass on your name to any body we meet who are requiring your type of services." Many thanks for your service." Many thanks for the prompt despatch of the quilt set for our Pegasus 534. We are very pleased with both the appearance and the quality. We really liked the option of being able to choose our own pattern and colourways - I guess nobody else will have exactly the same! The walnut whip panel on mushroom with nutmeg piping tones really well with the new Bailey upholstery and we are looking forward to trying it out next weekend on our maiden trip. "Hi , my wife and I have just had a wonderful 5 weeks away in France in our motorhome , and would like to let you know the Snuglux was "GREAT" . We found we had lots of options to adjust the tog level on us at nights ( most of which were very warm), also the non locking zip was a godsend and enabled a further option to stay cool. 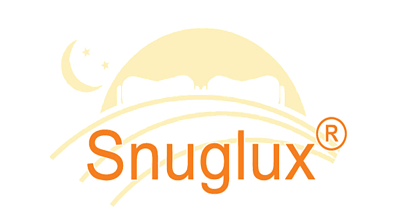 Another feature we liked was the fact that with the Snuglux we did not get a sweat on making up the bed , and all the tucking in we had before. While we were away the covers were washed several times and dried quickly without much in the way of creases. Snuglux ! A great idea ! We love it. One of our better buys. Keep up the good work , we have shown the Snuglux to several folks while we were away and to some relatives and friends at home with motorhomes." "I am thrilled to bits with my duo sleeping bag covers, the quality is excellent and I could not have received better service, I will tell all my friends about your great product which is extremely versatile to cope with british weather, many thanks Adrian & co."
"Good morning Adrian - you may or may not remember me but we purchased bedding etc for our Karmann Colorado TI from you in September/October this year - We took delivery of our new vehicle late October and have recently returned from a 7 week trip. The sheets, duvet and mattress protector were perfect fits, pillow cases also! The duvets wow they really are cosy tosey. So pleased we found your company and thank you for all your help in the lead up to purchase and following." "Hi Adrian, Many thanks for our order which arrived safely today. The bed cover we ordered is fabulous, and made very well, (as you know I am a trained machinist and know what to look for), not only were the seams good, but all `French' seams, which are always so much stronger.Overall the bed cover is superb,fits to a `tee', and looks lovely. Well done, thanks so much. We would recommend you every time, service is second to none."